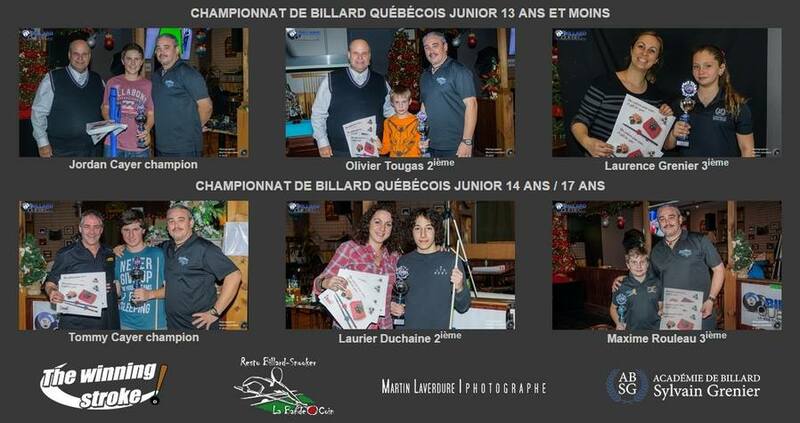 This past weekend was a busy one for pool in Quebec. The F.Q.S.B held their regular season tournament by hosting six different tournaments ranging from C to AAA skill levels. 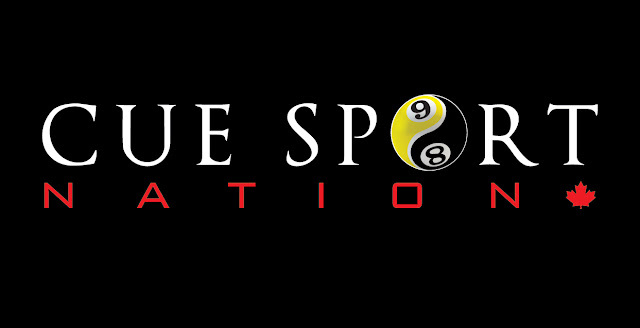 There was a Scotch Doubles tournament that my buddy Markus Noé from Cue Sport Nation attended. 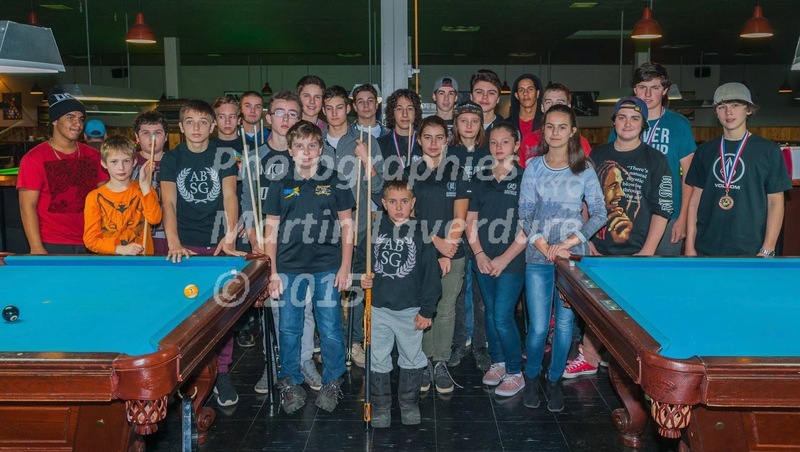 The 5th stop of the Falcon Tour held at the Toxedo Pool Hall in Sept-Iles (10hrs North East from Montreal) which was won by Sylvain Grenier beating Danny Hewit 11-6. However the most important of them all was the Provincial Juniors Championship which was held at La Bande a Coin in St Lambert Quebec. This is one of the few places that players under the age of18 can walk in and play because the hall does not have any Lottery Machines. There were six Players in the 13-under and 18 in the 14 over categories who participated. The main force behind this championship is one of the best French-Canadian players of all time Alain Martel. He is the founder of the ADBQ (The Quebec Association Development for Billards). With the help of other supporters from across the province they encouraged people into sponsoring a player for a cost of $52. This money would allow the players to enter 12 tournaments with a chance to qualify for the Championship. This weekend was a special one for the kids because everyone who participant received a $50 gift certificate from Canada Billiards and Bowling. The winners from each category (13-under and 14-17) would each receive a cue. But the most important was the fact that the winner of the 14-17 would receive paid entry and all expenses paid to play the Canadian Juniors in June 2016 in New Brunswick. Honors went to Tommy Cayer in the 14-17. This kid can play like a strong AA player. I was there this past weekend and saw him run 2 beautiful racks. Other players that were fun to watch was Maxime Rouleau. He plays in the 13 and under, Alain made the decision during the season to put him in 14-17 category because he was simply too good and crushing everyone with a perfect record. He ended up finishing 3rd. In the 13-U category Jordan Cayer (Tommy’s brother) won the event by beating Olivier Tougas. Alain Martel would like to thank the following that helped him in the 2015 Junior Development Program. Thank-you to Guy Simard and Tino Barbieri from billardquebec.com for the live coverage and his photographer Martin Laverdure.